I did a road trip last week and had almost 11 hours to “kill” while driving. So I’ve downloaded an audio book to accompany me all those hours. 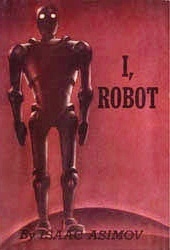 I chose ‘I, Robot’ a collection of short stories by Isaac Asimov. I have to admit that although I was aware on the core beliefs and the Three Laws of Robotics, I had never had the change to read (or listen) I, Robot. These dystopia stories captivate me from the start! If anyone havent yet read these stories, PLZ make yourself a present and read (or listen) them. After that, you should really watch the swedish TV series Real Humans / Äkta människor and/or the british version Humans which are about androids!